Where to Buy Minor Elements Soluble, Minor Elements Soluble Nutritional - 25 Lbs - $63.95 for Sale with Fast Free Shipping! 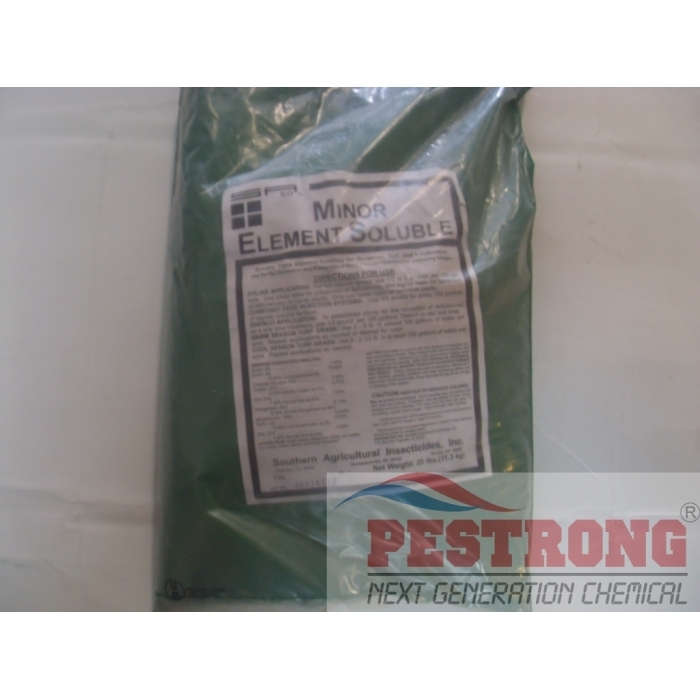 Minor Elements Soluble Nutritional - 25 Lbs is water soluble trace element fertilizer for nurseries, turf, and landscapes. FOLIAR APPLICATION: For full volume sprays use 1/2 to 2 pounds per 100 gallons. Use lower rates for prevention of deficiencies, and higher rates for correction of deficiencies on hardy plants. Only use lower rates on sensitive plants. CONSTANT FEED INJECTION SYSTEMS: Use 1/2 pound for every 100 pounds of regular soluble fertilizer. DRENCH APPLICATION: To established plants for the correction of deficiencies as a one time treatment, use 1/2 pound per 100 gallons. Drench to wet root area. WARM SEASON TURF GRASS: Use 2 - 5 lb. in at least 100 gallons of water per acre. Repeat applications as needed or desired for color. COOL SEASON TURF GRASS: Use 2 - 2 1/2 lb. in at least 100 gallons of water per acre. Repeat applications as needed. If you want to dry formulation use in the spreader, use Minor Element Dry. This is a nicely sized bag of many different elements that are very helpful for plant growth. I used this along with the usual fertilizer and I noticed better overall growth for my flowers.